Two days off in Istanbul, and I even managed a lie-in until about 08.30 each day! It was great to finally reach the city, after a long ride from Tarifa in Spain, and even longer from Nordkapp in Norway. It seems like a long time ago that I started this tour, at the beginning of May, however I still have about a month and a half to go, to pedal back to the UK, catch a ferry, and then back to Norwich via a few friends and family. Back to Istanbul, somewhere I’d been thinking about visiting for a long time, however I was feeling pretty tired after some long days in the saddle, so I didn’t do much on day 1; blog updates, snooze, lunch, snooze, walkabout, snooze, more food…snooze. I did manage to get out for a wander in the afternoon, taking in a few sights and walking over the river and back. When in a new city I like to just have a good ramble about, without any specific objective in mind, to get a feel for the place, taking in random sights, sounds and smells. Istanbul really is where East meets West, with so many colours, cultures and contrasts; people in conservative Muslim dress to fashions you’d see on the streets of Paris or Milan. There are all the usual high street chain shops you’d expect, however the smaller shops, street vendors and bazaars are far more interesting, to me anyway. It’s almost magical exploring the city for the first time, and finding out what’s down a narrow alley, around a jumbled corner, or through a crowded street market. There is of course loads of great food to be had, and lots to tempt you as you wander about; I opted for an Iskender Kebap in the evening, as recommended by my friend Hena. It was very nice, however I’m not sure it beats the kebab I had from Mr Kebab in St. Pauli, Hamburg; close thing however the latter was exceptional, also from a Turkish restaurant. I spent the rest of the evening chilling out at the hostel, chatting with the hosts or other visitors; always good to meet new people. Having not done a lot the previous day I was ready for some sightseeing, bracing myself to deal with crowds and queues. I’ve got a whole load of photos which will recount my day better than words. I walked over the bridge to the Old Town, after energizing myself with another great hostel breakfast, then visited the Topkapi Palace and Harem, the Basilica Cistern, the Sultan Ahmet Mosque (Blue Mosque), and Grand Bazaar. I also just had a good explore, so all in all it wasn’t that surprising that I was exhausted by the end of the day; sightseeing far harder than pedalling, and walking uses legs differently to pedalling. The Topkapi Palace is lavish and architecturally grand. It was a bit odd walking around the harem and reading about eunuchs and what life was like for the concubines; a different world! After the relative quiet of the harem it was a lot more crowded in the main palace, and I didn’t have the patience to queue for all the exhibits, however needless to say it’s an amazing place, and a staggering testament to the Sultan’s wealth, power and influence. Buildings like the kitchens were also really interesting, and the treasury, however you can’t take photos in them. There are whole rooms dedicated to making the royal confectionary; must have been some very good baklava. The treasury puts the crown jewels to shame, with artefacts and gifts from all around the world. Whilst the palace is amazing, my favourite visit was the to the Basalica Cistern; the largest covered cistern in the city, which is known about anyway – I wonder what else lurks beneath Istanbul’s streets, yet to be discovered (hopefully not Cthulhu). The Cistern was built by Justinian I in 537, and is a must see if you visit Istanbul; it’s also nice and cool down there. It’s unclear why there are two medusa heads, and why they’re upside-down or sideways, but they’re very cool; could be positioned that way of luck, like they did on axe handles. After the cistern I walked the short distance to the Sultan Ahmed/Ahmet Mosque, and had a sit down for half an hour waiting for prayers to finish – nice to listen to. It’s another building that’s very worth a look around, and great to visit a big mosque, rather than another cathedral; been to loads of them. You can also experience how important faith is in so many people’s live here, compared with for instance in the UK, where it takes a backseat for the most past. You have to take off your shoes to go inside, and no shorts allowed; I was pretty sure there’s a no lobster rule too so he got stashed in the bag with the shoes. Noticed my face is a lot thinner compared with when I started this tour! The last place on my list to visit in Istanbul, although you could spend days exploring further, was the Grand Bazaar; basically a huge shopping mall, but not in the modern sense. I think you could probably buy most things there, from antiques, to spices, leather goods, scarves, jewelery, food, tea and coffee, clothes, ornaments etc etc etc. Needless to say my legs were shattered after all that walking, so I stopped at the Irish Bar on the way back to the hostel for a pint and some food. My last evening in Istanbul was spent planning and chatting, with a quick excursion for an aubergine kebab and some baklava; the kebab was good but again didn’t beat Hamburg. The Baklava was excellent and topped up my energy reserves for leaving in the morning. Baklava – be rude not to try some before leaving; this was quite a lot though! Tomorrow I hit the road again, travelling North West on the final stage of my tour, back to the UK. There’s still around 2,000 miles to go, however I’m likely to be pretty focused on pedalling for a while, rather than sightseeing. I’m a bit nervous about border closures, with all the migrant/refugee movements going on, however I’ll just have to keep abreast of developments and re-plan if necessary; I’m sure it’ll work out fine, and they’ll be time for some exploring once I reach the Danube. This entry was posted in Self Propelled 2015, Turkey and tagged Adventure, Basilica Cistern, Bicycle Touring, Bike, Charity, Cycle Touring, Europe, Expedition, Istanbul, photos, Rest day, Self Propelled 2015, Sultan Ahmet Mosque, Topkapi Palace, Turkey on September 19, 2015 by SelfPropelled. Istanbul. A city I’ve been thinking about visiting for years, and now I’m here. I’m finding it slightly surreal after 4.5 months on the road, and nearly 7,800 miles pedalled. Reaching Istanbul completes my second major objective of the tour, and is a great sense of achievement after being pretty nervous about the route; just goes to show that getting out of your comfort zone, and overcoming your fears, is a good thing, leading to some great experiences. If you fancy flying or catching a train out to join me pedalling for a few days, drop me an email. It should be a fun ride back through Europe, especially the bit alongside the Danube, pedalling literally through castles, and through more countries I haven’t been to before. Number of rest days: maybe 11, need to check, I lost track a bit when staying with friends in France. If I exclude rest days I’ve pedalled about 100km a day. Number of new tyres: 2 – Schwalbe Marathon Plus finally wore out near Toulon. Got some Malamut tyres to replace them which seem to be working okay, but think they’ll wear out a lot quicker. Favourite stop: With friends in France (Ardeche, Provence, Marseille), followed closely by Tarifa. Istanbul may yet rival. Friendliest country: Not had an unfriendly one, however Albania is winning at the moment; can’t count France as was with good friends there anyway! I’ve heard the expression ‘the city that never sleeps’ applied to lots of places, however I think it truly fits Istanbul. I have rarely been to anywhere quite so vibrant; a bustling metropolis with so much to experience. I wasn’t sure if I make it all the way today, after a few long days in the saddle, and 90 miles left to pedal before reaching objective 2 of my tour, however once I got going I knew I wouldn’t stop before I’d made it; barring mechanical failure. After a very good night’s sleep, and consuming a buffet breakfast included in the price, I felt ready for the ride ahead, and the good news was my legs didn’t feel to achy after the previous few day’s efforts. My conscientious application of suncream of course summoned the clouds, however little could dampen my spirits as I approached Istanbul. I rejoined the D110 after leaving crazy Tekirdag behind, and started the long ride East. The road got steadily busier as I got closer to my destination, and I had to tackle a series of big ascents, climbing a total of 1285m during the course of the day. The D110 turned into the D100, passing Silivri, and several other large towns on the way, all merging into a constant metropolis along the coast to Istanbul. The traffic got crazier and crazier, meaning I was on high alert, with a two lane road turning into 3 lanes, and roads merging or diverging at regular intervals; I used the service road running next to the main road quite a lot, however it was just as busy. Before it got really busy I paused at a garage for an ice cream break, preparing myself for the last 50km to Istanbul; the ‘suburbs’ really do go on for a long way! After a final long climb, passing a high tower that’d been on the horizon for ages, things got really exciting. It’s not that it’s particularly dangerous, as although the driving is madness everyone seems very alert and conscious of what’s going on around them. There was a lot of beeping, and I had to move quickly on a number of occasions to cross slip roads, or move around traffic. City riding, although mentally tiring, can be good fun as long as you’re careful and cycle ‘defensively’; which basically means be a bit aggressive and make sure people know you’re there. Istanbul is awash with buses and yellow taxis, and I started to encounter more and more of these as I made it past the airport and into the city proper, letting out an involuntary ‘yabbadabbado’ as I got closer to finishing objective 2. I crossed over a final bridge (Unkapani I think), which moved about a lot, then rode up a last hill to Taksim Square, where I paused to locate a hostel on my phone. There was a promising looking one about 500m away, right in the centre, so I made my way there. My luck held out as they had space, so I booked in for 3 nights; may change that to 4 depending on how I feel. Often when entering a city I get a feeling within the first hour as to whether I’m going to like it. With Istanbul the feeling was pretty immediate, especially after a warm greeting from Esme at the hostel; the city has a buzz to it, and I immediately felt at home, and excited about having a proper explore. It was nice to check in knowing I had a few day’s rest coming up, with no need to worry about where I’ll be sleeping, or whether there’s going to be a pack of wild dogs around the next corner! After a shower I went out for a wander around the Beyoglu district, which is the main shopping area, and separated from the old city by the bridge I’d crossed earlier. I’ll probably visit the old city the day after tomorrow, as tomorrow is going to be dedicated to rest and relaxation. The streets were packed with people; a diverse range of nationalities and appearances. I enjoyed listening to the street musicians who appear regular intervals, and generally taking in the sights and sounds. I wasn’t particularly surprised to find an Irish Bar, and thought it providence that I stop there for a cold beer to celebrate my arrival. Despite the buzz of the city I was feeling pretty tired after 4 serious cycling days, so I retreated to the hostel for the rest of the evening, and enjoyed chilling out with the staff and a few of the other guests; Australian, Turkish, US, Israeli, German – you always meet other interesting travellers. Thank you to all recent donors; you’re all fabulous! 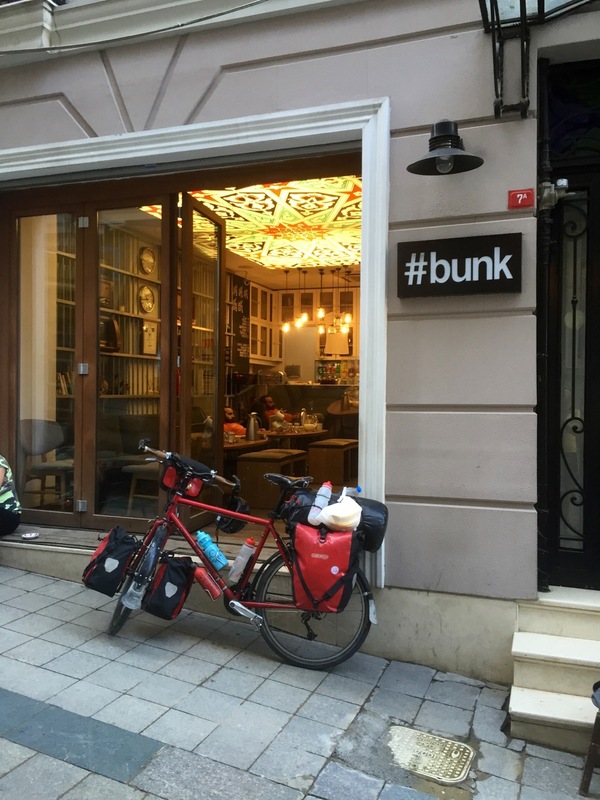 This entry was posted in Self Propelled 2015, Turkey and tagged Adventure, Bicycle Touring, Bike, Charity, Countryside, Cycle Touring, Europe, Expedition, Istanbul, photos, Self Propelled 2015, Turkey on September 16, 2015 by SelfPropelled. I was sad to leave Jorn, Clara and Tom, however it was time to set out solo again, on my way to Istanbul before turning North towards home. Team Thessaloniki were up to see me off, before they went in search of boxes to pack their bikes into for flying home; not something I’ll need to worry about, touch wood, as I’ll be pedalling home. I bid them au revoir and cycled off, with a big climb ahead of me to get out of the city and on the road towards Turkey. My emotions were a bit mixed on setting out solo cycling again. I was sad to be leaving good company, but also excited to be setting out on the road to Istanbul, to complete the second major objective of my tour. I planned a few big legs to get there with enough time for a few days off, before turning my wheels back towards the UK; it’s going to be weird heading for home. The climb up over the hills from Thessaloniki was taxing on several fronts. The ascent I could handle, however I wasn’t quite prepared for the number of stray/wild dogs. The small road wound up through pretty forest, however I didn’t really have time to enjoy it or take photos, and would recommend other cyclists take the main road instead. The dogs are a complete menace, with packs of them lounging by the roadside. A few just looked at me, however more often than not they’d get excited, start barking and chase after the bike. My nerves were jangling as I pedalled up the steep gradient, alert for ‘mans best friend’ making an appearance. Unfortunately I couldn’t pedal fast due to the hill, and was pretty terrified when at one point I was surrounded by 7 or 8 snarling hounds. The advice is to get off your bike and walk, as then they’ll lose interest, however I wasn’t sure that was the best option for a pack of wild dogs. I snarled and shouted back, and carried on, mindful of any of them sneaking up behind me as they are want to do; they start off at the side or in front, then circle around to come at you from behind, much like velociraptors I reckon. They didn’t bite me, and I’m not sure they would have done had I stopped, but I didn’t want to risk it. Dogs continued to be a menace throughout the day however that was the worst ambush I encountered; Greece really needs to do something about their stray dog problem. Lots of people waved and shouted greetings or good luck as I pedalled East, passing two big lakes as I followed the main road, then along the coast in the afternoon. I stopped for a lunch break at Lidl; always reliable and cheap wherever you are in Europe. Water looks very tempting, however beware sea urchins!! It was nice riding next to the sea, and mostly flat, however I still managed to climb over 940m in total today; the headwind was a bit of a pain too however I haven’t had to endure one for a while. I bumped into a French touring couple and their young son near a large lion statue, and stopped for a chat in the shade. They are touring Europe for a year, and are from Marseille; they live next to Luminy, where I lived for a year, and where I was a few weeks ago – small world! It was good to speak French again, and to meet more tourers and hear about their experiences and plans; we compared route notes before I carried on. It’s pretty amazing to be touring for a year, especially with a young son (maybe 5 to 6). I hope they get on alright in Scandinavia where it’s likely to get a little chilly! With a while to go before I reached a campsite, but with the option to just sleep on the beach, I pedalled on. As I was on my own I really wanted to make a campsite, as I was still nervous about dogs causing a problem. After a long day I made it to Paradiso camping in Nea Iraklistsa, or Eleftheres, not far from Kavala; for €10 a night and peace of mind it had been worth the long ride. There were lots of Bulgarians staying at the campsite and making merry (they drink…a lot); I guess they travel down to the coast for their holidays. I settled in the for evening, eating dinner from supplies I bought at Lidl, and amusing myself with the kitten roaming the campsite. 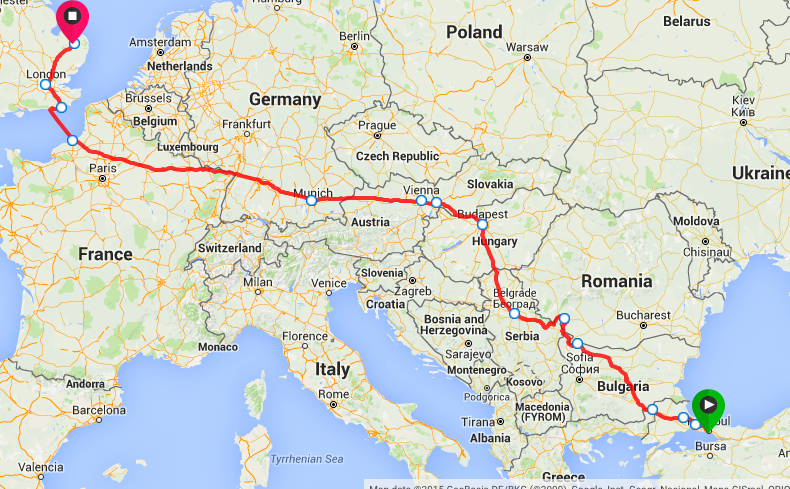 Long day planned again tomorrow, to Alexandroupoli, which should be my last stop in Greece. Today turned out to be the longest ride of the tour to date, covering 185km in about 9.5 hours; a good time for me, especially as I still climbed nearly 1,000m in total. As a result I was pretty tired when I stopped for the evening, so I’ll keep this brief. So today turned out to be mostly a cycling day, with the usual dog avoidance tactics. I set off in good time from Paradiso camping, and pedalled to Kavala, a large port town with boats going out to the islands, including Samothrace. Samothrace would be an interesting place to visit another time; it’s the site of the Sanctuary of the Great Gods, the ancient city of Palaeopoli, and was home to several mysterious cults, each with their own rituals an practices in ancient times. Kavala itself is a bustling town, with lots of fishing by the looks of it, and several interesting features including a hilltop fortress and viaduct. The road led me inland to Xanthi, then back down to the coast on my way to Komotini. These were pretty long stretches of riding, passing numerous signs for archaeological attractions, thermal baths, and through a nature reserve. I soon passed the 100km mark, with another 85km still to go if I wanted to reach Alexandroupoli. The dogs today were in no way as bad as yesterday, however I still had to be on the look out and got barked at or chased a few times. During one pause I encountered a friendly hound who just wanted to say hello, with a whole body tail wag thing going on; a nice change! To finish the day and get to Alexandroupoli I had to get over the hill from Sapes, and down to the coast, a long climb alongside the Via Egnatia. This old Roman road was constructed in the 2nd century BC, to link various colonies all the way from Albania to Constantinople; I think I’ve been following its rough route for some time now, as it passes by Lake Ohrid, then through Macedonia, Greece and on into Turkey. Needless to say I passed yet more signs for more holes in the ground interesting ancient archaeological sites. I also passed a lot of farmers harvesting sunflowers on my way through the countryside, with mounds of seeds being shovelled into sacks. Sorry about the finger intruding on those photos; the hazard of taking a photo whilst pedalling! You could spend a lot of time exploring this corner of Greece (Macedonia and Thrace), however I haven’t got a few weeks to spare right now, but might come back at some point; I find the historical period around Alexander the Great pretty fascinating. I eventually made it to Alexandroupoli, and found the Municipal Campsite close to the city centre, and next to the beach; a comfortable and non-crowded site, with its own restaurant and decent bathrooms. There were a couple of German motorcycle tourers I chatted to for a bit, however mostly I just wanted to rest after a long day, and do some last-minute preparation for Turkey; already had the Visa but wanted to learn a few basic phrases and check the route to Istanbul. After a basic meal and trying to learn the Turkish for ‘hello’, ‘please’, ‘thank you’ etc, I nodded off in my tent, not waking up until about 03.00 in the morning, having failed to brush my teeth. I’d also been motivated by wanting to get to Istanbul and out of ‘bad dog’ territory, however I have the feeling it’ll be similar in Turkey, and perhaps with even less in the way of campsites; not too worried about that as they’ll be cheap hotels along the route, and wild camping is always an option. Whatever happens it’ll feel good to be pedalling towards home, rather than further away from it; looking forward to boring friends and family with my tales from the road. I pedalled out of Alexandroupoli, and on to the border with Turkey, passing quite a few Greek military vehicles along the way, and dealing with several hills and a headwind which woke my legs up. I had to take the motorway on the last stretch to the border, as there wasn’t another option, however there were hardly any cars on it, and a wide harder shoulder and no dogs meant it felt like the safest bit of road for a while. It took a little while to get over the border, due to a slight queue, however once they’d stamped my passport and checked the photo of my Visa on my phone they waved me through, past all the waiting cars and lorries. I’d half expected to see queues of migrants/refugees a the border, trying to get into Greece, however none were evident; the border guards were checking car boots pretty carefully though. It’s quite a long border crossing from Greece to Turkey, over a river, and passing armed soldiers at regular intervals on both sides; they all waved or said hello, but don’t think they get on with each other very well still. There were lots of flags flying on both sides, however I think the Turks win on the who has the largest flag front! There followed a very long ride, down a pretty boring and at times bumpy main road, to Tekirdag. I passed Ipsala, Kesan, Malkara and Inecik, as well as several smaller towns, as I cycled down the D110, which proved to be quite busy, with traffic ranging from dilapidated but still functioning tractors, to modern and expensive looking cars, as well as a lot of lorries. The road also passes over one hill after another, meaning I climbed a total of 1360m today, resulting in very tired legs by the end; first time my legs have really ached in a while. There are a lot of garages along the way, providing ample opportunities for drinks or toilet breaks, and the people are all really friendly; only got barked at by a few dogs too. I benefitted from a mostly cloudy day, so didn’t get too hot, despite the hills, however the headwind made things tough going at times; inconsistent too, which is just irritating. There’s a campsite about 14km on from Tekirdag, however my legs were just too tired to pedal any further, and besides, it was getting late with the sunset just an hour away. I stopped in Tekirdag and found a hotel right on the seafront for the equivalent of £20 a night, including breakfast; this felt like a bargain, with an en suite bathroom, and what to me is a luxury room (air con etc). I’d recommend the Hotel Rodosto to anyone passing through; friendly, cheap, and convenient. 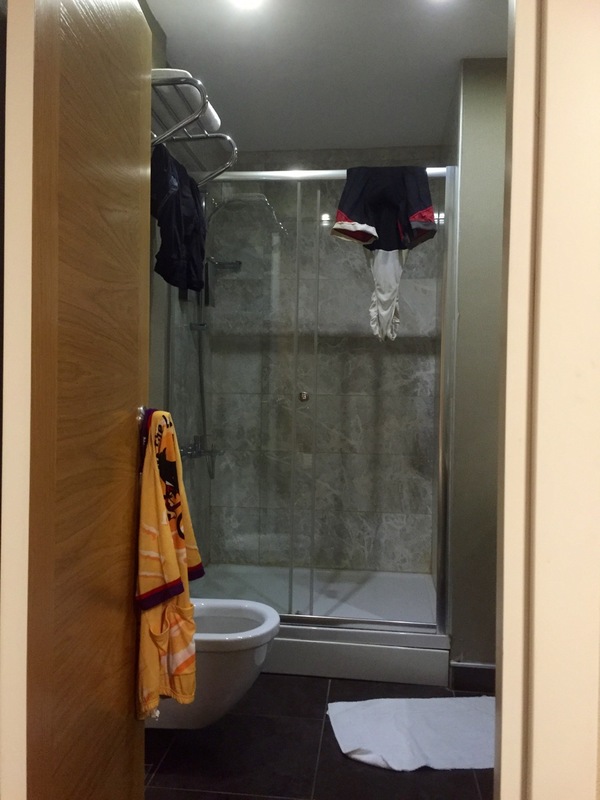 I was quite excited about my en suite bathroom; also washed cycling gear, much-needed! After settling in I headed into town to withdraw some Turkish Lira, and visit a supermarket for dinner. I was really hungry after another long day, and my legs were in serious need of refueling, so I returned to the hotel with a lot of food, spending the evening eating, phoning home, and checking the route for tomorrow. Depending on how my legs feel in the morning the plan is to cycle all the way to Istanbul tomorrow, which’ll get me there a day sooner than expected, with more time for a mini holiday before heading for home. Bonus! This entry was posted in Greece, Self Propelled 2015, Turkey and tagged Adventure, Alexandroupoli, Bicycle Touring, Bike, Charity, Countryside, Cycle Touring, Europe, Expedition, Greece, photos, Self Propelled 2015, Tekirdag, Turkey on September 16, 2015 by SelfPropelled.